If you are involved in a business or have one yourself, it’s likely that you have numerous important files stored on your hard drive. These files need to be protected at all cost. If the company I work for would lose all files, it would be a disaster. Sure, it’s always possible to backup data (and I hope you do) but if we can avoid the problem from the beginning, that’s a better solution. In comes the solution (for power failure at least), an uninterruptable power supply, or UPS. It can save your hardware and your files by having the server or computer go on battery for a while if the external power would go out. A UPS is a piece of hardware that will ensure that your computers and/or server(s) will keep being powered on if you lose your main external power source. A UPS will keep everything operating for at least a few minutes after a power failure so that you can shut everything down properly and avoid damage and file loss. A UPS will instantly take over from the main supply in the event of failure. You may consider a standby generator to be a good alternative to a UPS but even the best generators need a little time to start up when the power fails, and this can be enough time for your computer equipment to die or be damaged and important files to be lost forever. The main function of a UPS is to protect your computer equipment and files against a total power failure. 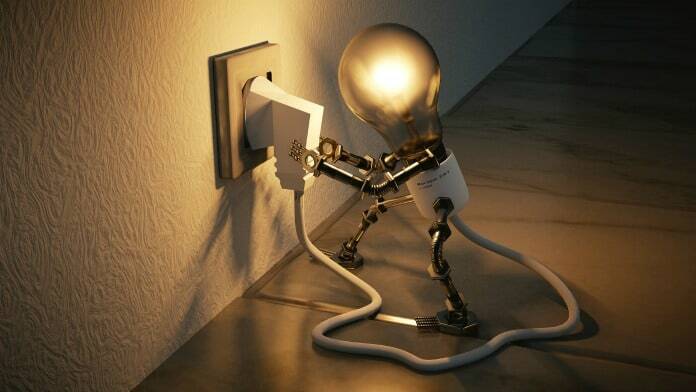 Power failures often occur due to a problem with the electrical grid, but there are other instances where power can be lost such as a fuse blowing or even that you forgot to pay your electricity bill! A good UPS will also protect your computer equipment against sudden surges in voltage and voltage spikes. An electrical supply from any utility organization will never be perfect and there may be times when there is just too much voltage coming through to your equipment. When this happens, your computer equipment is very much at risk of total failure. This is why this Outlet Surge Protector on Amazon is so popular. 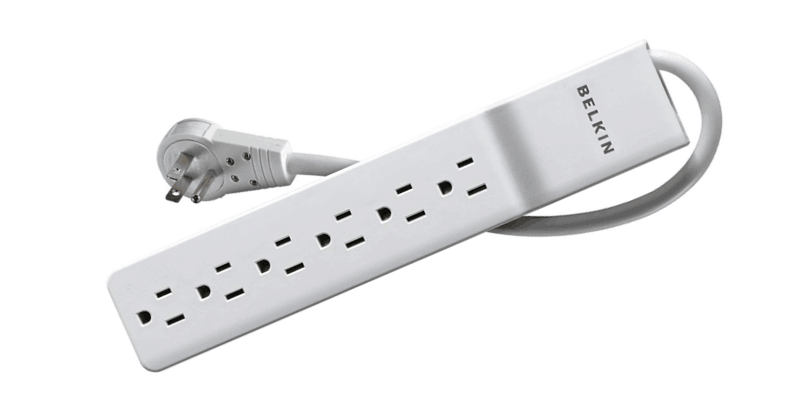 The Belkin 6 outlet power strip is a popular power surge protector on Amazon. Less likely than excessive voltage instances are voltage sags. This is where the voltage from your power outlet drops considerably and is not high enough to keep your computer equipment powered on. A lot of UPS systems will protect against this as well, while outlet power surges will not. The standard frequency for power supplies in the United States is 60 Hertz. If the frequency changes significantly up or down, which it can, then this can cause problems for your computer equipment. If you get a UPS, make sure that it will protect you against frequency fluctuations. There are different types of UPS systems which I will explain in detail later on. No matter which type of UPS system you choose, they all work in a similar way. Your UPS will include batteries which charge when the electrical supply is present. There will also be circuitry in the UPS which converts the battery output into an alternating current (AC) supply that is similar to that provided by the mains supply when power is lost. A power inverter circuit provides this alternating current. As soon as the main power supply fails the batteries in the UPS provide a power source to the inverter circuit. The batteries will discharge at a rate dependent upon the total load on the UPS system. Once the direct current supply from the batteries falls below a threshold voltage, the inverter will stop working. So, dependent upon the load on the UPS you will only have a small amount of time to save files and power down all of your equipment safely. Usually, you will have between five and fifteen minutes of uninterrupted power so you need to act fast. With some UPS systems, you can prolong this time by adding additional batteries. A UPS is mostly a battery. When the mains power is available the UPS will operate in bypass mode and there will be an output switching circuit which will connect the mains supply directly to the load (computer equipment). The output switching circuit is usually a series of solid state switches but this can vary from one UPS to another. All UPS systems will have either a sine wave or simulated sine wave output. The sine wave output is the best quality as it provides smooth AC power with repetitive oscillation. Only the most expensive UPS systems will produce a sine wave output. The simulated sine wave output is an approximated sine wave. A pulse wave modulation technique creates the simulated sine wave approximated output. This kind of simulation sine used in the less expensive UPS systems. The static bypass provides a defense mechanism should any problems develop within your UPS system. If the UPS was to completely fail then the static bypass removes the UPS circuitry from the mains power and diverts it around the batteries and rectifier so that it connects directly with the load. There is no conditioning of the mains power in this situation but it will keep your equipment operating. The rectifier in a UPS system does tow jobs. The first of these is to ensure that the batteries are charged and maintained at the required float voltage. There are different kinds of rectifier configurations and some will provide just a trickle charge while others will fast charge the batteries to around 905 and then trickle charge to 100%. The second job of the rectifier is to convert the incoming alternating current (AC) to direct current (DC). A UPS system can have a single battery or several batteries depending on the load supported. The battery is the most important element of a UPS system as it will provide the power that your computer equipment needs should a mains failure occur. UPS batteries connect in series and this means if one battery fails then the entire battery string will fail. Because of this the more “high end” UPS systems will have an alternative battery string to provide redundancy. When you use any UPS system it is very important that you check the batteries regularly. 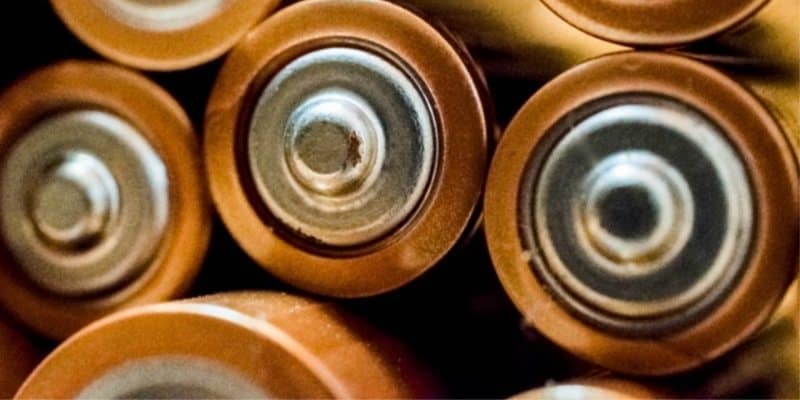 All batteries will degrade the more that they are used and even if they are never used they can degrade with age. The inverter relies on DC power from the DC bus provided by the rectifier and the batteries when the main power is working. When the main power fails the inverter will derive DC power from the batteries only. The job of the inverter is to convert the DC power into AC power simulating the mains power to your computer equipment. What are the Different Types of UPS Systems? The most common type of UPS used in homes and small offices is the “standby” type. A standby UPS monitors the mains power input and will switch over to the battery and inverter supply if there is a mains power failure. It can take around 10 milliseconds for the switching to occur. With an online UPS, there is a continuous supply of power to the computer equipment by the UPS components. This means that the batteries and inverter are continually supplying power whether the main electrical source is available or not. Online UPS systems work in a similar way to a battery in your laptop computer. When you have your laptop plugged into the main power it is still deriving power from the battery. The mains power charges the battery and if there is a power failure then your laptop will continue to work for a period of time because the battery is in place. The main difference between standby and online UPS systems is that your computer equipment will never suddenly shut down if there is a power outage with an online system. Standby UPS systems do switch over fast but there is still a possibility that some equipment may shut down due to the switching delay. An online UPS system is usually more expensive than a standby (sometimes called line interactive) system. What Type of UPS Should You Get? There are several things to take into account when choosing a UPS system for your home or office. The first of these is the cost. There are small UPS systems available designed to protect a single computer that may cost around $100 and there are more powerful systems that can protect a small network that will cost a lot more. You need to work out how much power your equipment draws in order to find a suitable UPS for you. You can use something like this P3 P4400 Watt Usage Monitor on Amazon to find this out. Once you know, you will need to determine how long you want your equipment to stay powered on if the power cuts out. At the very minimum, you are looking for your UPS system to have enough capacity to enable you to shut down all of your computers properly to avoid potential damage and file loss. Most desktop computers require separate power supplies for the associated monitors so do not forget these. 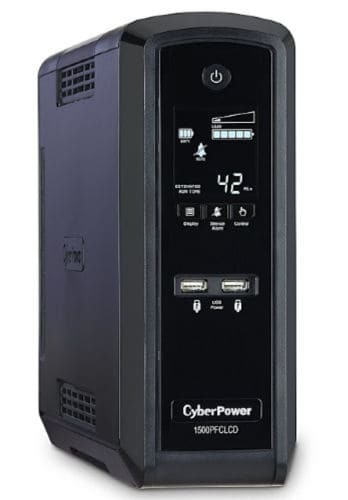 A very popular UPS that can handle most home office equipment is the CyberPower CP1500 on Amazon. With this UPS, you should be able to keep working for a few minutes and then shut down your computer safety. If you are running a server or two, I would recommend something bigger, just to be sure. But don’t forget that a UPS can’t save you from everything that can happen to a computer. Always keep your files back up properly.